Almost a month since Matt Wilkinson won the Outerknown Fiji Pro at Cloudbreak, we now shift our focus to the action in Jeffrey's Bay in the Eastern Cape Province of South Africa. The Corona J-Bay Open runs from the 12th-23rd of July, but with only a moderate swell approaching we may see a few lay days at the the beginning with the swell looking to rise over the coming week. J-Bay is commonly known to feature some of the best waves in the world and when conditions are right, you can witness 1km rides from Boneyards through to The Point. J-Bay consists of ten different sections, the most common of all is Supertubes where the event is usually held. The name says it all, maintaining high speed through sections like Supertubes is vital, with surfers rarely enjoying that time to score with cutbacks. Jeffrey's Bay was only known for its waves, until Mick Fanning was famously attacked by a shark in the beginning of his final against Julian Wilson. Even though this was the first incident at J-Bay during a contest and a couple of years have passed, there is no doubt that it would still play in the minds of the competitors. Fanning came back the following year and won J-Bay for the fourth time. Fanning comes into this contest without a victory this year. His closest attempt was when he made the quarters at Bells and Rio in which he lost both by less than a point. Watching Fanning at J-Bay is like watching Slater at Pipeline, he is one of the fastest surfers on tour and when wave selection is crucial he picks the better waves. He is certainly a chance to take out back to back victories at J-Bay. After a successful Fiji Pro we now have a new leader in the standings. Matt Wilkinson now leads the league ahead of John John Florence and Jordy Smith. Wilko won his second contest of the year, beating other countryman Connor O’Leary in a ripping final at Fiji and now has his eyes set of J-Bay. Unlike last year when he struggled through the second half of the season, he has pushed forward and is the most consistent surfer on tour at the moment. The question is can he challenge the likes of Smith, John John and Fanning on his backhand? After one of the most craziest solo performances of the year at Margaret River, we all thought John John would easily take out this year, but after dropping to second in the standings with a round three exit to Fioreavanti we all start to wonder will he bounce back? He is an easy favourite to take out this event alongside hometown hero and third in the standings Jordy Smith who is looking for his third J-Bay title in the past seven years. Jordy has had the perfect lead up to J-Bay after he took out the final at the Ballito Pro for the second time. It's a staggering statistic but since the event started in 1996 there has not been a goofy foot surfer win at J-Bay. By no means that does not say it's impossible, with the likes of Medina, Wilko and Owen Wright among the top goofy foot surfers and are a chance to break the drought. As we close on another Jeffrey's Bay contest, keep a close eye on wildcard contender Michael February who has earned his spot in this event with a semi final lost to Jordy Smith in the Ballito Pro and has the ability to go the distance. 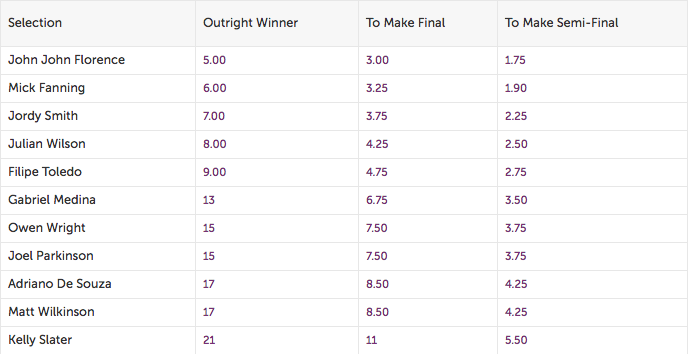 Connor O’Leary is also a notable mention as he almost knocked off Wilko in the final in Fiji, and has quietly moved up the leaderboard to seventh place. 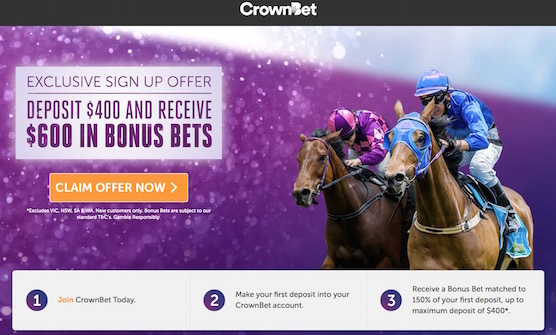 CrownBet also have a great 150% - Click to create and account today and score up to $600 in Bonus Bets! Just make sure to read terms and conditions before signing-up, but certainly don't miss out on this one! Make sure to read terms and conditions of any promotions before placing a bet - some specials may not be available in all states!